Exam Board: AQA Level: GCSE Grade 9-1 Subject: English Literature First Teaching: September 2015, First Exams: June 2017 Our best-selling An Inspector Calls GCSE Grade 9-1 revision guide has everything you need to score top marks on your GCSE Grade 9-1 English Literature exam right at your fingertips! 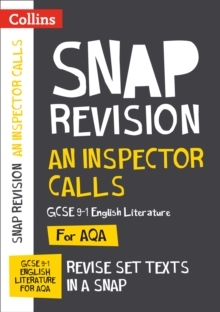 Revise An Inspector Calls by J.B. Priestley in a snap with this new GCSE Grade 9-1 Snap Revision Text Guide from Collins. Refresh your knowledge of the plot, context, characters and themes and pick up top tips along the way to ace your AQA exam. Each topic is explained in an easy-to-read format so you can get straight to the point. Then, put your skills to the test with plenty of practice questions included in every section. The Snap Text Guides are packed with every quote and extract you need. We've even included examples of how to plan and write your essay responses! This Collins English Literature revision guide contains all the key information you need to practise and pass.